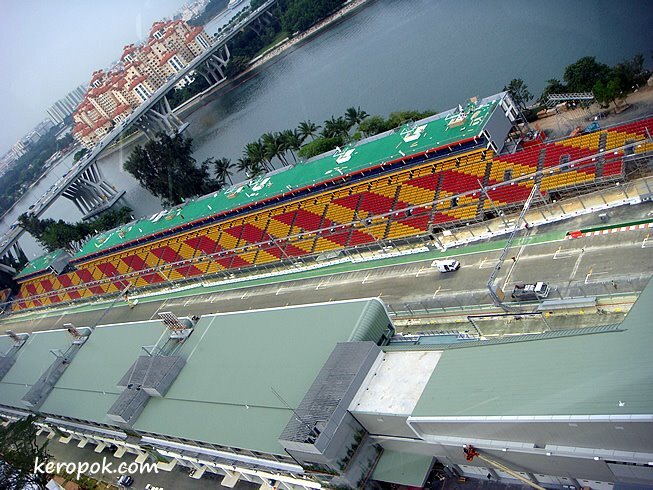 The bird's eye view of the Grand Prix Pit and also the Pit Grandstand. Oh, the seats here cost SGD1388. You think only the rich can afford it? No, the rich will get it free, courtesy of their banks. That is if you are a preferred customer of Standard Chartered, ING, Credit Suisse, Citi, Societe Generale or RBS. Credit Suisse clients will be at the BMW Sauber Paddock, with seats costing SGD7500, with free flow of champagne and gourmet banquet. RBS clients will be at a cocktail event at the Old Supreme Court building, mingling with 3 time world champion Jackie Stewart. Citi Singapore will be hosting a Stylo Fashion Grand Prix Gala. SG Private customers will be cruising in a private yatch along the Southern Islands. Wow full of activities. You wont see me sitting there...lol. Beautiful photos. Aaaah, something Monacans and Melbournians can identify with! All very grand. They are lucky but do they really enjoy the race? I doubt it! Great arial shot. Where was it taken from? Singapore Flyer? Very expensive for those ticket. Hope the weather holds out.